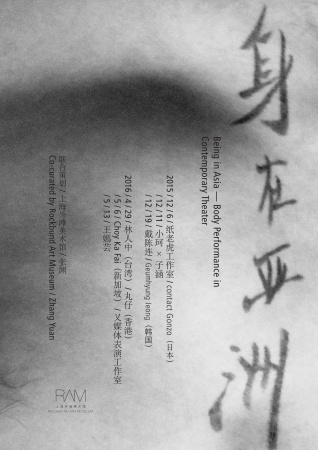 From December, 2015 to May, 2016, over a period of six months, we invited artists and artist groups to participate in the project “Being in Asia.” Ten performances and one discussion took place in Shanghai in an attempt to re-examine contemporary theater art in Asia from the perspective of the “Body.” The project also aimed at placing Mainland China back in the context of “Asia,” in order to open up new spaces for conversation. It’s been two years since the initiation of this project. The question we raised was not met with the ideal answer, but a new round of problems waiting to be explored. The idea of “Asia” has become increasingly vague, be it in geographic, cultural, historical or racial sense. A common goal is always pointed at, but never reached. The West has also fallen into a dilemma, trying to spare some of its attention for the “Asia” it perceives as. And yet, the non-existent “Asian Community” seems to be in no rush to complete its own manifestation. The most important issue of it all, despite physically being in “Asia,” how far exactly is China from “Asia”? As a performance art project happening in a museum setting, the subtitle “Body Performance in Contemporary Theater” is more or less directly to the theme. For the past two years, performance art has been re-ignited in Chinese museums and contemporary art spaces, whether as main course or dessert. The scope and reach it has achieved in the new setting way surpassed what it did in the stagnant theater system. “Body” is still the starting point for most performances, from which new and diverse contexts are expanded to, and unknown energy and possibilities are awakened. The Body is the Contemporary. We use the body as measurement to understand the age we live in. Artists who participated in the program entered the discourse from different points, then happened into conflux, and finally opened up new aspects. The “pairing” of artists in each performance reflected simply the curator’s own instinct at the time and could look very differently now. A performance only knows its live situation, but the responses and resonance can be recorded in words later. For two years, we conducted interview with every artist who participated in the program. If there is a mirage of the “Asia,” we would like to offer a witness report in this publication. I want to express the most sincere gratitude toward Shanghai Rockbund Art Museum and Hugo Boss Asia Art for their support to the program. I want to especially thank Ms. Chen Dongyang, through whose effort every step of the way was this project made possible. I want to also thank Ms. Chen Dan, who offered precious advice and help to this publication. Of course, I want to thank all the artists, writers, documentation makers and staff members who participated in this project, as well as three artists who accepted our invitation but could not join us for various reasons. They are Mallika Taneja of India, Melati Suryodarmo of Indonesia and Wu Meng of China.